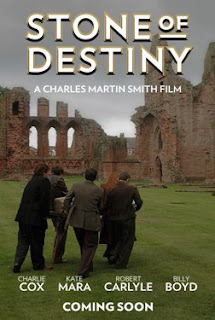 STONE OF DESTINY, the latest film from actor-turned-director Charles Martin Smith, will open the 2009 edition of the Palm Beach International Film Festival on Thursday, 23 April. The film, a US/Scottish co-production, retells the fascinating and true story of four young Glaswegian students who, in 1951, outwitted the British authorities in their successful attempt to take back the Stone of Scone - a beloved symbol of Scottish pride. The adventure comedy stars Robert Carlyle (TRAINSPOTTING), Peter Mullan (BOY-A) and Brenda Fricker (MY LEFT FOOT).